PMC's Starfire hollow points use a high-expansion design that incorporates cutting ribs to enhance penetration. 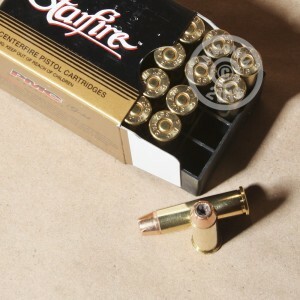 This design gives these .357 Magnum cartridges even greater power to end self-defense situations favorably and quickly. 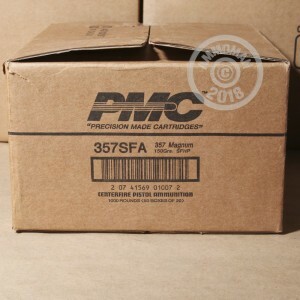 Each round in this box of 20 fires a 150 grain jacketed hollow point projectile at a muzzle velocity of 1,350 feet per second. 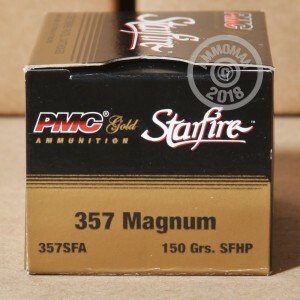 This ammo is manufactured in South Korea by a major defense contractor and uses non-corrosive Boxer primers and brass cases.